Instant downloads of all 946 LitChart PDFs (including The Lion, the Witch and the Wardrobe). 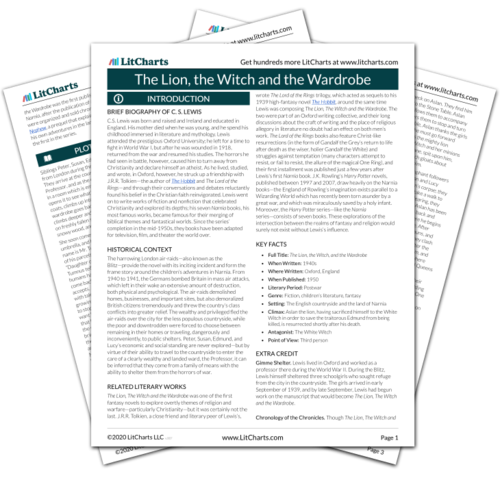 Welcome to the LitCharts study guide on C. S. Lewis's The Lion, the Witch and the Wardrobe. Created by the original team behind SparkNotes, LitCharts are the world's best literature guides. A concise biography of C. S. Lewis plus historical and literary context for The Lion, the Witch and the Wardrobe. A quick-reference summary: The Lion, the Witch and the Wardrobe on a single page. In-depth summary and analysis of every Chapter of The Lion, the Witch and the Wardrobe. Visual theme-tracking, too. Explanations, analysis, and visualizations of The Lion, the Witch and the Wardrobe's themes. The Lion, the Witch and the Wardrobe's important quotes, sortable by theme, character, or Chapter. Description, analysis, and timelines for The Lion, the Witch and the Wardrobe's characters. Explanations of The Lion, the Witch and the Wardrobe's symbols, and tracking of where they appear. An interactive data visualization of The Lion, the Witch and the Wardrobe's plot and themes. C.S. Lewis was born and raised and Ireland and educated in England. His mother died when he was young, and he spend his childhood immersed in literature and mythology. Lewis attended the prestigious Oxford University; he left for a time to fight in World War I, but after he was wounded in 1918, returned from the war and resumed his studies. The horrors he had seen in battle, however, caused him to turn away from Christianity and declare himself an atheist. As he lived, studied, and wrote, in Oxford, however, he struck up a friendship with J.R.R. Tolkien—the author of The Hobbit and The Lord of the Rings—and through their conversations and debates reluctantly found his belief in the Christian faith reinvigorated. Lewis went on to write works of fiction and nonfiction that celebrated Christianity and explored its depths; his seven Narnia books, his most famous works, became famous for their merging of biblical themes and fantastical worlds. Since the series’ completion in the mid-1950s, they books have been adapted for television, film, and theater the world over. 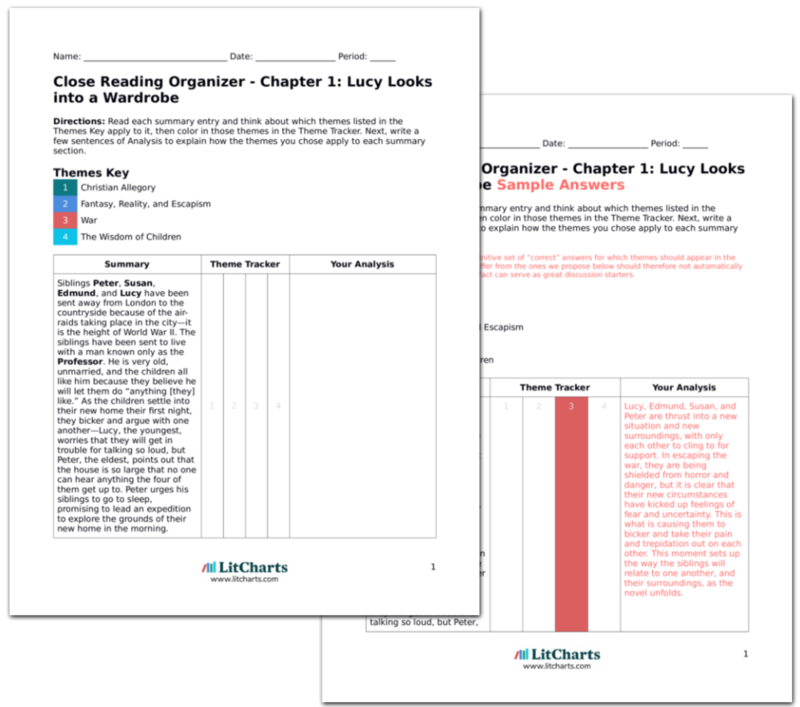 Get the entire The Lion, the Witch and the Wardrobe LitChart as a printable PDF. The harrowing London air-raids—also known as the Blitz—provide the novel with its inciting incident and form the frame story around the children’s adventures in Narnia. From 1940 to 1941, the Germans bombed Britain in mass air attacks, which left in their wake an extensive amount of destruction, both physical and psychological. The air-raids demolished homes, businesses, and important sites, but also demoralized British citizens tremendously and threw the country’s class conflicts into greater relief. The wealthy and privileged fled the air-raids over the city for the less populous countryside, while the poor and downtrodden were forced to choose between remaining in their homes or traveling, dangerously and inconveniently, to public shelters. Peter, Susan, Edmund, and Lucy’s economic and social standing are never explored—but by virtue of their ability to travel to the countryside to enter the care of a clearly wealthy and landed ward, the Professor, it can be inferred that they come from a family of means with the ability to shelter them from the horrors of war. The Lion, The Witch and the Wardrobe was one of the first fantasy novels to explore overtly themes of religion and warfare—particularly Christianity—but it was certainly not the last. J.R.R. Tolkien, a close friend and literary peer of Lewis’s, wrote The Lord of the Rings trilogy, which acted as sequels to his 1939 high-fantasy novel The Hobbit, around the same time Lewis was composing The Lion, The Witch and the Wardrobe. The two were part of an Oxford writing collective, and their long discussions about the craft of writing and the place of religious allegory in literature no doubt had an effect on both men’s work. The Lord of the Rings books also feature Christ-like resurrections (in the form of Gandalf the Grey’s return to life after death as the wiser, holier Gandalf the White) and struggles against temptation (many characters attempt to resist, or fail to resist, the allure of the magical One Ring), and their first installment was published just a few years after Lewis’s first Narnia book. J.K. Rowling’s Harry Potter novels, published between 1997 and 2007, draw heavily on the Narnia books—the England of Rowling’s imagination exists parallel to a Wizarding World which has recently been torn asunder by a great war, and which was miraculously saved by a holy infant. Moreover, the Harry Potter series—like the Narnia series—consists of seven books. These explorations of the intersection between the realms of fantasy and religion would surely not exist without Lewis’s influence. Climax: Aslan the lion, having sacrificed himself to the White Witch in order to save the traitorous Edmund from being killed, is resurrected shortly after his death. Gimme Shelter. Lewis lived in Oxford and worked as a professor there during the World War II. During the Blitz, Lewis himself sheltered three schoolgirls who sought refuge from the city in the countryside. The girls arrived in early September of 1939, and by late September, Lewis had begun work on the manuscript that would become The Lion, The Witch and the Wardrobe. Chronology of the Chronicles. Though The Lion, The Witch and the Wardrobe was the first published work in the Chronicles of Narnia, after the publication of all the installments, the books were organized and sold chronologically—The Magician’s Nephew, a prequel that explains the Professor’s backstory and his own adventures in the land of Narnia, is now presented as the first in the series. Tanner, Alexandra. "The Lion, the Witch and the Wardrobe." LitCharts. LitCharts LLC, 15 Sep 2018. Web. 11 Dec 2018. Tanner, Alexandra. "The Lion, the Witch and the Wardrobe." LitCharts LLC, September 15, 2018. Retrieved December 11, 2018. https://www.litcharts.com/lit/the-lion-the-witch-and-the-wardrobe.